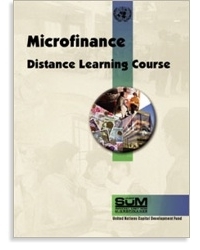 This entry was posted in education, microfinance on April 22, 2013 by microfinance. On May 12th, Nobel Laureate Yunus Muhammad resigned from Grameen Bank after a two and a half month battle with the Bangladesh government which was determined to remove him as the head of the successful bank he created. It is a sad and unjustified chapter for Prof Yunus but this shall not discredit what the microfinance movement has accomplished and its continuing positive impact. Prof Yunus addressed his colleagues a letter on his departure, asking them to to remain strong and united. I thank Yunus for his wonderful and inspiring work which lead me (and many others) to move from mainstream into the world of social enterprises. I have no doubt that he will continue impacting lives through his work in creating social businesses. Just two days before, on May 10th, I attended an exhibition on “How I can make a difference” by the 5th graders at the Inter-Community School in Zurich. This is a programme that requires that students engage in a collaborative, transdiscipplinary, inquiry process that involves them in identifying , investigating and offering solutions to real-life issues or problems. 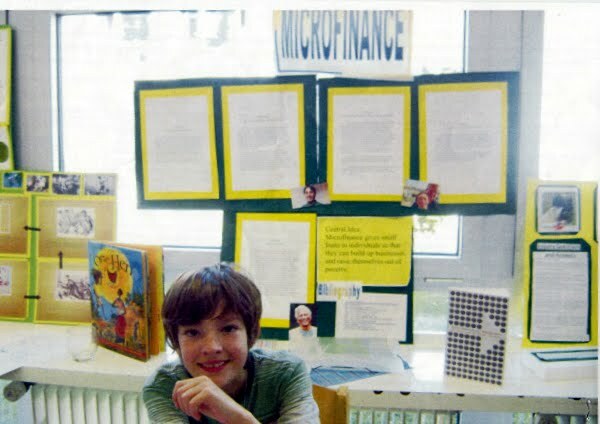 Connor Frey, one of the bright 5th graders (and the son of my friends Ali and Markus) had chosen “microfinance” as his topic. A month ago I was interviewed by Connor on this subject. I was very impressed and moved to see Connor’s exhibits about microfinance, the history, about Yunus Muhammad and the pamphlete he made on the dos and don’ts on investing in microfinance. He is passionate about the subject and spreading the word! Great job, Connor. I could not stop thinking that Yunus would have enjoyed seeing his exhibition. This entry was posted in empowering people, microfinance, social entrepreneurship on May 15, 2011 by microfinance. The microcredit crisis in India has been unfolding since mid October when the state of Andra Pradesh issued an ordinance to crackdown on microlenders. The ordinance required that all microlenders cease disbursing and collecting loans, register to the authorities and declare the interests charged. The state was concerned with the explosive growth of loans and around 50 suicides reports by rural men and women that were attributed to overindebtness. Although some of the MFIs have been able to resume their activities this kneejerk reaction by the state of Andra Pradesh has sent the industry into a crisis and is more likely to do harm than protect the poor borrowers. Shares of SKS Microfinance which had a successful IPO in August this year has been plunging and is currently less than half of its peak in September.The Indian microcredit industry is the largest in the world. The state of Andra Pradesh is the center of microcredit in India and home to India’s largest MFIs such as SKS, Spandana, BASIX and Share Microfin as well as the government nurtured Self-Help Groups or SHGs. There has been excellent writeups on this subject and background which I can highly recommend. This entry was posted in empowering people, history, innovative partnerships, microfinance, microfinance investments on November 17, 2010 by microfinance. This I believe will become a “classic” or the debate between “who should benefit from microfinance”. My humble opinion…I think that both have valid points and there is enough room for both ideals as there are so many people in need for basic services at the BOP or bottom of the pyramid. This entry was posted in conference/symposium, empowering people, microfinance, microfinance investments on September 30, 2010 by microfinance. Kiva.org, the world’s first microlending website announced today its entry into the education field by offering a pilot for student microloans in 3 countries. So beginning today anyone can make a loan starting at USD 25 to students that are selected by Kiva’s first 3 education field partners; Fundacion Paraguaya (Paraguay) IMPRO (Bolivia) and Ameen s.a.l. (Lebanon). Kiva.org an innovative social enterprise created a movement to connect people around the world through lending to alleviate poverty. In only 5 years, Kiva.org has provided over USD 160 mn in loans to 415,000 microentrepreneurs around the world and these loans (which are as little as USD 25) have come from close to half a million lenders spread in 206 countries! This entry was posted in empowering people, innovative partnerships, microfinance, platform, social entrepreneurship, venture philanthropy on September 20, 2010 by microfinance. Some interesting reports/studies have been recently published. This was brought to my attention by Microcapital. Microfinance’s Midlife Crisis from the Wall Street Journal , Assessing the Role of Microfinance in Fostering Adaptation to Climate Change by Shardul Agrawala and Maëlis Carraro, and Microfinance and Inequality by the Macrothink Institute written by Hisako Kai and Shigeyuki Hamori. This entry was posted in microfinance on March 18, 2010 by microfinance. “Small one-time subsidies – leverage large multiples of unsubsidized funds – producing sustainable delivery year after year of highly valued services that help hundered of millions of people – keep their consumption stable, finance major expenses, and cope with shocks – despite incomes that are low, irregular, and unreliable. In retrospect, it is very likely that in the past years the rising popularity of microfinance and its impact had become over-blown. 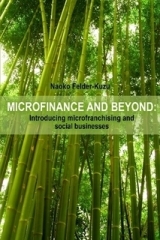 Proponents of microfinance (including this author), in their quest of raising awareness of this powerful and effective tool to improve the life of the BOP, have been too enthusiastic and most likely also helped create the overhyped state. So the recent critical articles are deflating the overly high expectations that were built on microfinance and its impact. This is a healthy sign. I thank David Roodman and his excellent open-book blog which has been providing a critical view on the many issues surrounding the impact of microfinance. This entry was posted in empowering people, microfinance on January 16, 2010 by microfinance. This book introduces innovative social/business models that provide sustainable solutions to the problem of poverty and portrays the insipiring people behind them.You can find an update on microfinance, BOP (base of the pyramid) initiatives, and microfranchising all which are improving the lives of the 4 billion people living at the BOP. VisionSpring, an innovative social microfranchising enterprise with the mission to reduce poverty and generate opportunity through the sale of affordable reading glasses is featured as a model case. The aim of this book was to share my insights on 1) how the business and social worlds have been converging, setting the stage for these innovative models to emerge, 2) how these models, together with the advent of Web 2.0, are creating a strong and positive movement towards a more responsible, sustainable and kinder world and 3) how all of us could make a difference. This book is the updated English version of the German book that was published last year. I used lulu.com to publish this and I can recommend it. This entry was posted in empowering people, impact investments, microfinance, microfinance investments, MicroFranchising, publications/presentations, social entrepreneurship on December 7, 2009 by microfinance.